Sunday May 29 1910 Rob is 27 years old today. Weather windy after the rain last night. Will & Art Jones went to the fair ground in the morning. I busy with the work. I wrote to Mary Briggs. Alice Condon & Lydia Mason Rob & Cora were here awhile. Will went after "Bess" at the fair grounds. Our first [illegible] of strawberries from the garden. 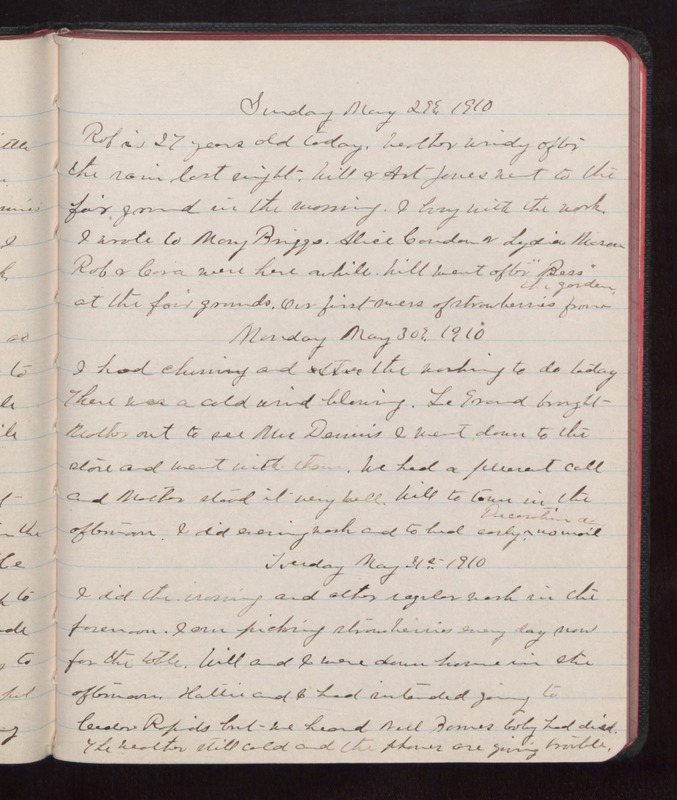 Monday May 30 1910 I had churning and the washing to do today There was a cold wind blowing. Le Grand brought Mother out to see Mrs Dennis I went down to the store and went with them. We had a pleasant call and Mother stood it very well. will to town in the afternoon. I did evening work and to bed early. Decoration day no mail Tuesday May 31 1910 I did the ironing and after regular wash in the forenoon. I am picking strawberries every day now for the table. Will and I were down home in the afternoon. Hattie and I had intended going to Cedar Rapids but we heard Nell [Rames?] baby had died. The weather still cold and the [phones?] are [giving terrible? ].